Physitrack was designed from the ground up to enable practitioners inside clinics to work together. Your basic Physitrack license allows you to add multiple licenses for other practitioners within you clinic. This allows you to share information between your licenses, plus billing is taken from the one account. Go to My account and select the "Subscriptions" tab. Click on the "0 colleagues on subscription" button, then click "Add colleagues to subscription". Enter the email address of the colleague you would like to add, and click "Add". 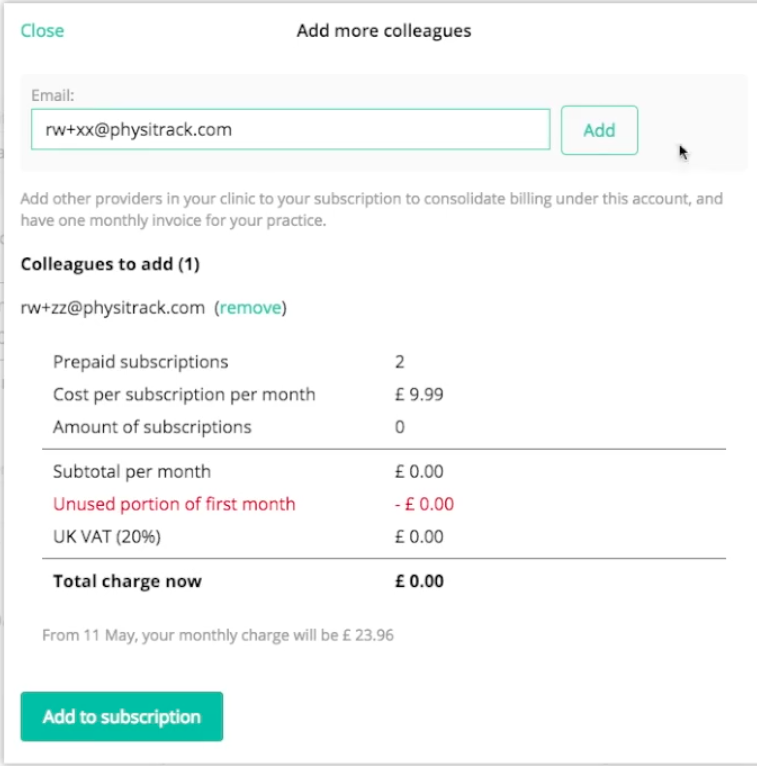 Continue adding in the email addresses of the other colleagues you would like to create Physitrack licenses for, clicking the "Add" button after each one. When all email addresses have been entered, finally click "Add to subscription" to complete the additions. The next page that is displayed shows you the financials associated with these additions. Note: For practices with 10 or more licenses, we advice you to get in touch at sales@physitrack.com. We offer a free solution called Physitrack Direct which makes managing licenses and information sharing easier for larger practices. For more information on how to add subscriptions and share information between colleagues, watch our pre-recorded webinar.